Amazing how much these guys can actually push you further than you think the car can go - definitely worth the £25 per session! Yesterday would have been perfect for beginners, plenty of space on track and great weather, good standard of driving aswell, apart from that black GT3 gen 2 upset a few people I heard! Posted: Sun Mar 17, 2013 9:33 pm Post subject: Want to do the occasional trackday - aware of anything? 2005 C2S aero kit, Post IMS updates?, short shift, PSE, Chrono Plus, Bose, Sports adaptive seats, Full Black leather with ALum dials surround. Aside from sensible prep beforehand, you need to keep an eye on tyre pressures. If you're using standard road tyres, I would aim for not more than 34F 38R measured when hot. Tyre wear will be considerable if they are allowed to go too much above those pressures. Build up speed slowly, pace yourself & the car. 20 minute stints is a good starting point. Keep yourself hydrated to maintain concentration. Remember to do a cool-down lap to allow the brakes to cool & then stop the car & leave in gear without the handbrake on. ...nor sit stationary with the footbrake on when you come in. It's worth putting a decent brake fluid in the system, say Motul RBF600, which works on road and track. Buy a decent helmet - you only have one head. After the helmet, insurance is next on the priority list!! I've only once had oil starvation with my 986 on track and that was Rockingham (banked for part of the circuit) so I don't think you need to worry about that. Boiling brake fluid could well be a problem though - depends on how fast you are and your braking style. More general stuff, tyres and brakes, these get worked much harder on track than on the road. I did my first track days last year, did one in April and loved it and ended up going for two more. Biggest mistake the first time was staying out on track too long (I was having so much fun). With standard tyres and pads/fluid, the tryes went off after 5 or 6 laps, this will vary from track to track. But staying out on them once they've gone off makes the cornering rubbish and wears the outer edges incredibly fast. Standard brakes also went off quickly for me (6 or 7 laps), but again will depend on the track. So on my first track day by lap 9 or 10 I really wasn't achieving much due to lack of traction from tyres and lack of stopping power from the brakes. Second day was much better, did a max of 6 laps in a session including a warm up and cool down lap. Third day I fitted dot 5 brake fluid and EBC yellowstuff pads, stuck to my 6 laps and I think I had a good balance. Finding the limit of your 911 is a very unforgiving experiment. You can push an m3 to its limit and when the rear lets go its very predictable and easily fixed. something like this: "GRIP GRIP GRIP! IM GOING TO LET GO IF YOU DO THAT! THATS IT IVE LET GO! BUT PROD THAT ACCELERATOR AND CORRECT THE WHEEL AND I'M ALL YOURS"
abusing a 911 in the same way will result in one sure thing - planting it in a tyre wall or worse. Everytime you find yourself pushing the car, getting faster faster and getting more confident is probably the best time to bring it back to the paddocks! The 911 is an all or nothing car ie GRIP GRIP GRIP, THEN NO GRIP. THERE's not really any between, and because if where the engine is, it is not easily fixed unless you at pro level and have tamed your beast. If you want to find the boundaries - pick a track with plenty of run off or an airfield. That way when the tyres let go - you won't be sticking it on trailer back to the body shop for a very expensive repair not covered by insurance. I don't push it in the corners but I can vouch for investing in Sort Cups tyres - worth every penny and will see you managing those corners far quicker than road tyres with less risk of letting go unexpectingly. Maybe this is the case for a 911 pre 1989, but a properly geo'd car post '89 will not be. The cars got better with every incarnation and certainly a 997 doesn't just throw you off when the tyres start to lose grip! ....I don't push it in the corners but I can vouch for investing in Sort Cups tyres - worth every penny and will see you managing those corners far quicker than road tyres with less risk of letting go unexpectingly. You don't push it in the corners? Sounds like some training wouldn't go amiss! 911s are great in corners, especially for traction on the way out. And yes, Sport Cups are also road tyres and good in the dry but not so good in the wet. Sport Cups are good, but I think the best dry tyre is a Toyo 888 and wet/all weather a Pilot Super Sport. The OPs 997 will not spit him off once the limit has been found, just get the car geo'd and make sure all the tyres/brakes/levels are up to the job. Go and have a hoot. ...... as iirc you both have the same car. abusing a 911 in the same way will result in one sure thing - planting it in a tyre wall or worse. My experience is very different from the above. My 993 is set-up to oversteer not understeer, and it gives me plenty of warning, and is very progressive and controllable when grip has departed. Deliberately provoked to get the back out coming out of the chicane at Goodwood. One VERY important thing is make sure you tighten up your wheels nuts after a track day; or at least check to make sure they are not loose (from experience). Did my first 911 track day a couple of months ago. My brakes/fluid went off after about 6-8 laps as did the tyres RE50A's. I have just had Pagid Rs29's and Super blue fluid put in for my next track day this month. I think Cups/Corsa's/888 would be good to have. Brakes have got SRF fluid in them - didn't have any brake fade at all. In fact the faster I went the better they got. Glad you had a good trackday, SRF fluid is the best. The best pads, although expensive, are made by a company called 'Endless'. They last about 5 times as long as standard stuff, brake harder but are about 2 or 3 times more expensive. Posted: Wed Nov 13, 2013 10:08 pm Post subject: Track Day Preparation ? My first trip in the 997 has been booked, five days, three tracks (as above) in June '14. Ive done a few trackdays in the past, Le Mans, Zandvoort, Dijon, Ledenon etc etc on the continent so i can do the driving, but what parts am I likely to need to take for the trip? The car is a 997 C2 which will be on new rubber and brake discs/ pads, but I'll take new pads, brake fluid and oil. Anything else? When does fade typically set in on these tracks on standard stoppers? from big speeds (130mph +) you'll start encountering fade sooner rather than later. you're parked up...just leave it in gear !. 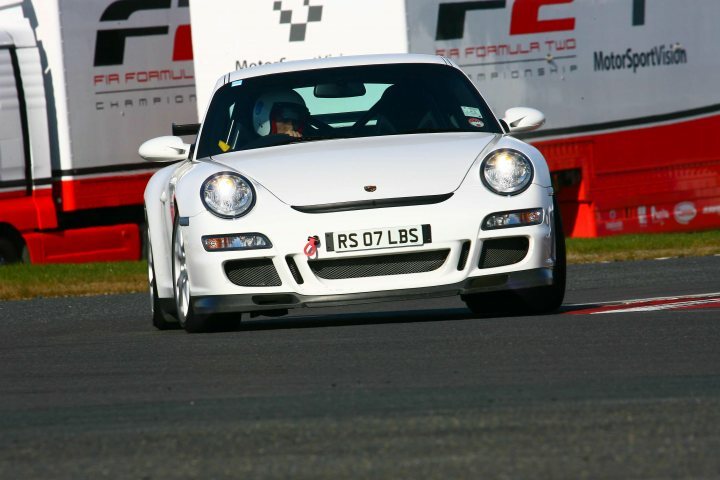 Greg - you might want to post up in the GT forum as the guys over there do a lot of track days than the the ones on the 997 forum.